Do you want to decorate your clothes with something unusual, original and stylish? Or just don’t know how to use the leftover yarn? 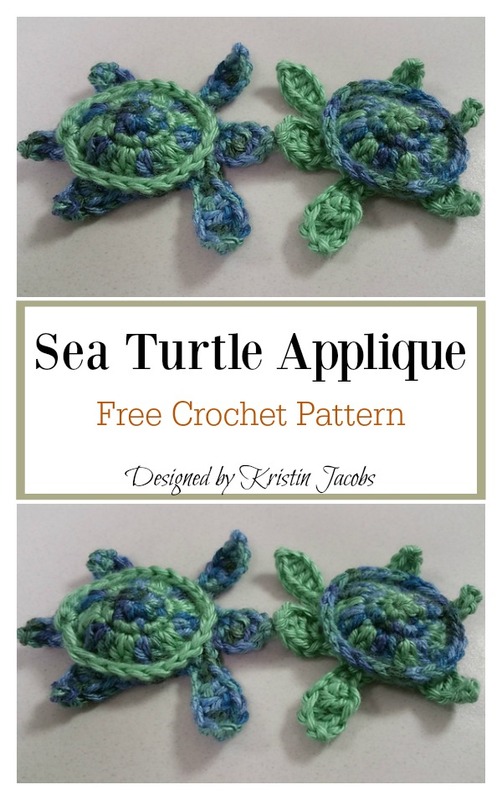 Then the Sea Turtle Appliques Free Crochet Pattern is what you are looking for. With a delightful design and colors this crochet applique will bring joy and happiness to anyone watching it. They can be used in a wide variety of projects such as scrap-booking and card making. You can sew them on hats, bags, clothes, pillows. They would be perfect to decorate skirts, blouses, sweaters etc. Crochet appliques literally transform children’s clothes. A simple, unremarkable, white T-shirt or bodysuit will become a stylish outfit that attracts the eye. Crochet appliques are very fast projects to make and they require very small amount of yarn. Thanks Kristin Jacobs and Natalina Craft for sharing these free patterns. The links for the free patterns are provided below photos. Happy crocheting. You might also like African Flower Hexagon Motif Turtle Free Crochet Pattern.